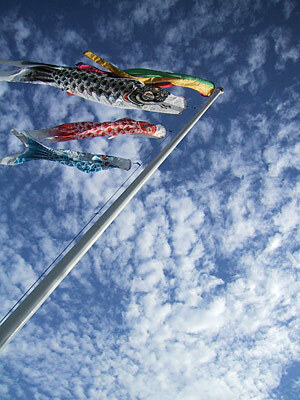 i’ve never expected to see such a japanese thing, “koinobori” in portland, maine. Great photo tomoko! I bet it was surprising to see that in maine! what an amazing sky, too! I really enjoy this photo. Its breezy, and love the colours. Eartha » thanks! i could expected to see it here in san diego since there are so many japanese but not in maine.mama » ねー、やっぱりこういう日本の物ってとっても素敵ですよね！lynn » yes the sky! i realized i took so many photos of the sky & clouds during this trip. :-)Jinky » thank you! the sky in the photo looks higher than it was!pukka » 見つけちゃいましたー。うふふ。holgaのモノクロで同じようなのを撮ったんですけど、これはカラーの勝ちでした。matt » wow, how long are you going to stay in tokyo?btezra » thank you! from my memory this flag is for boys, right? izzy » yes it is. sort of unfair for girls! ?teeta » thank you so much!